A FabLab (Digital Fabrication Laboratory) is halfway between a laboratory and a workshop. It’s a place where you can make (almost) anything, where both small children and inventors can turn an idea into reality. FabLab came into life as an outreach project from the Massachusetts Institute of Technology (MIT) Centre for Bits and Atoms (CBA). In 2012 at team from MIT, including Prof Neil Gershenfeld , visited Belfast to assist in set up, train staff and launch the project. 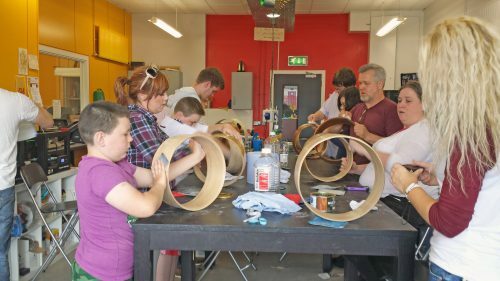 Since opening FabLab Belfast has engaged with local schools and communities to offer our services and encourage them to tap into their inner creativity and get busy making all sorts of things. Inside the Lab is state of the art computer controlled machinery that includes a 3D printer, a laser cutter, CNC router, full electronics station and a large scale vinyl cutter. FabLabs have spread from inner-city Boston to rural India, from South Africa, the Basque Region and to the North of Norway and now number over 450. Activities in FabLabs range from leaning how new technology works, accredited training, craft & making session, local problem-solving to small-scale business support and research. The mixture of equipment and open access enables anyone to use FabLab. Novices through to experienced engineers can make something within the space, with skilled technical staff on hand to assist you through the process of making your idea come to reality. All you need is your design and we can begin to make it. Even if you are stuck for an idea, you can find a wealth of suggestions, ideas and projects online. We can make products out of wood, acrylic, composite moulds, silicon, cardboard, sheet aluminium, plastics, copper foil and vinyl. There are waxing, chemical moulding, milling and routing, laser cutting, electronics, textiles, vinyl cutting and 3D scanning and printing facilities. Accredited Training Courses (Age 14yrs +): FabLab Belfast can deliver OCN in digital fabrication giving you an introduction to the exciting world of digital fabrication and gain a qualification while learning in a relaxed and creative environment. School Engagement: Our schools engagement programme works with teachers and students to promote design and digital fabrication in the classroom as an essential skill in today’s hi-tech economy. Our programme works with primary and post primary schools across Northern Ireland. Workshop programmes: We facilitate a varied programme of activity for all ages aged 8 – 80, our workshops start with beginner activity for those who’ve not used computer software before to more advanced usage for people with more experience. We run workshops in making crafts, furniture, toys, instruments, robots through to manufacturing techniques using laser cutters and 3D printers and using specialist design software. 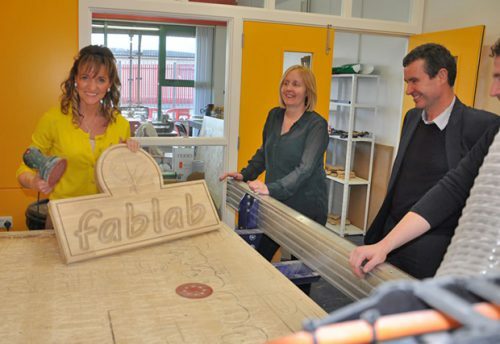 FabLab Belfast can tailor a workshop experience for groups to suit their learning needs and level of ability. Enterprise Training (Groups): A programme for teams to have fun, develop team working skills, creative thinking and pitch new business ideas. Teams can work together to produce and manufacture product ideas in an engaging and stimulating environment. Open Access: Free discovery days for the public to come in and spend some time learning about FabLab or being to work on a personal project. Design & Manufacture Service (Rapid Prototyping Service): A bespoke service for those looking to develop a proof of concept prototype or designed or manufactured. Discovery – Find out about computing, making stuff from keyrings to furniture to musical instruments to repairing old electrical items. You can learn loads in a relaxed easy going atmosphere and friendly helpful staff will build your confidence in the new and exciting field. 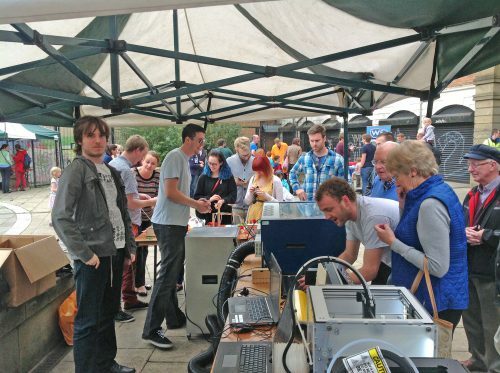 Access – You can come and find about FabLab and the exciting at one of our many open days. We also run workshops for school & community groups and have public sessions that you can sign up to. No experience is necessary and we welcome all ages, if you are 16 or under we ask parental consent to visit at an open day. Education – Get involved and gain a new accreditation, you can also find out about how what you learn in FabLab Belfast can be continued at school or college, further education or online.